Single incision laparoscopic surgery (SILS) and NOTES (Natural orifice translumenal endoscopic surgery) are novel challenging minimally invasive endoscopic surgery. The first barrier of the SILS and NOTES is management of surgical instruments in the peritoneal cavity. Because of the unpredictable nature of endoscopic view and orientation, these forced situations result in an incomplete or lengthy procedure within such limited and narrow operative field. For overcome these limitations, we developed novel computer guided 3-D navigation systems of magnetic resonance endoscopy and magnetic scope detection system with GPS. We investigated feasibility of the high-spatial-resolution magnetic resonance endoscopy to detect the microstructure of the gastrointestinal and colorectal wall and the vascular architectures. Also we included evaluation of the magnetic scope detection system to depict scope position and scope movement three-dimensionally in the abdominal cavity. Study 1: Normal dissected porcine stomach and colon (n= 6) and living porcine (n=4) were examined with high-spatial-resolution spin-echo MR system using an original RF coil (40 mm) and a head coil as transmitter. MR images were obtained with a field of view of 8 x 8 cm, a matrix of 256 x 128 and a slice thickness of 3 and 5 mm. 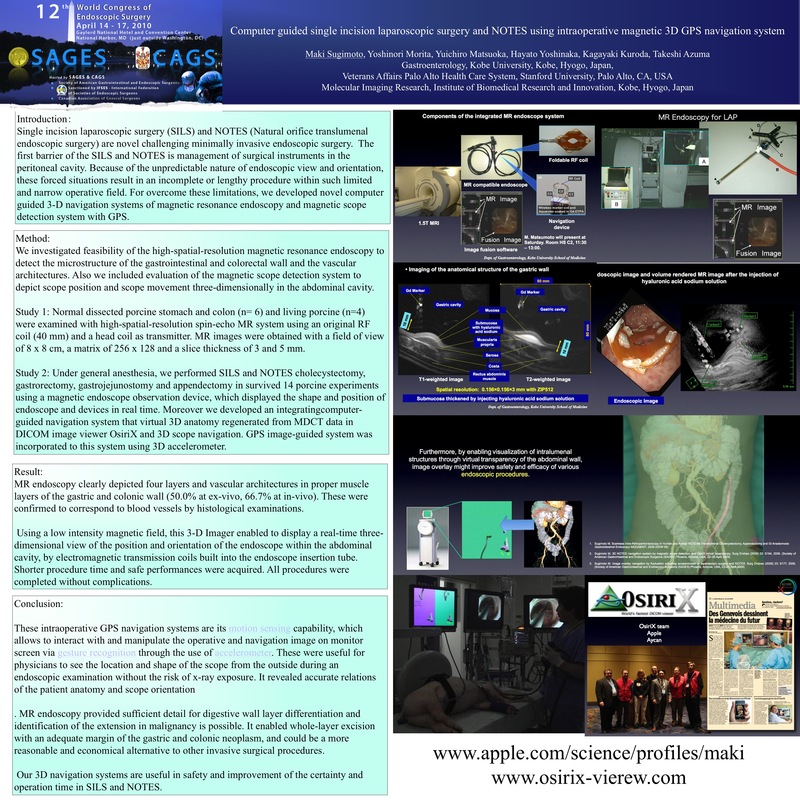 Study 2: Under general anesthesia, we performed SILS and NOTES cholecystectomy, gastrorectomy, gastrojejunostomy and appendectomy in survived 14 porcine experiments using a magnetic endoscope observation device, which displayed the shape and position of endoscope and devices in real time. Moreover we developed an integratingcomputer-guided navigation system that virtual 3D anatomy regenerated from MDCT data in DICOM image viewer OsiriX and 3D scope navigation. GPS image-guided system was incorporated to this system using 3D accelerometer. MR endoscopy clearly depicted four layers and vascular architectures in proper muscle layers of the gastric and colonic wall (50.0% at ex-vivo, 66.7% at in-vivo). These were confirmed to correspond to blood vessels by histological examinations. Using a low intensity magnetic field, this 3-D Imager enabled to display a real-time three-dimensional view of the position and orientation of the endoscope within the abdominal cavity, by electromagnetic transmission coils built into the endoscope insertion tube. Shorter procedure time and safe performances were acquired. All procedures were completed without complications. These intraoperative GPS navigation systems are its motion sensing capability, which allows to interact with and manipulate the operative and navigation image on monitor screen via gesture recognition through the use of accelerometer. These were useful for physicians to see the location and shape of the scope from the outside during an endoscopic examination without the risk of x-ray exposure. It revealed accurate relations of the patient anatomy and scope orientation. MR endoscopy provided sufficient detail for digestive wall layer differentiation and identification of the extension in malignancy is possible. It enabled whole-layer excision with an adequate margin of the gastric and colonic neoplasm, and could be a more reasonable and economical alternative to other invasive surgical procedures. Our 3D navigation systems are useful in safety and improvement of the certainty and operation time in SILS and NOTES.